Restaurant Week has returned to Chennai and this thirteenth edition of RWI runs from Friday, 16th September to Sunday, 25th September, 2016, featuring 12 restaurants in our city. This year’s RWI is presented by Ola Prime, thereby giving food enthusiasts the opportunity to dine at some of India’s finest restaurants at a fraction of a la carte rates. As of this round, Restaurant Week will be featuring healthy and diet friendly options on the Restaurant Week menus. These menu items will include gluten free, vegan, low carb and low sugar options for health conscious diners. Diners in Chennai are offered, as usual, a three-course prix fixe menu at Rs. 750 for lunch and Rs. 900 for dinner. All pricing stated are per diner, exclusive of applicable taxes, service charges as well as dishes ordered outside of the special Ola Prime presents Restaurant Week menu. This round of the largest culinary event in India will once again feature Restaurant Week Signature options over and above an extensive hand-picked menu, giving diners the option of experiencing a restaurant’s signature dish at an incremental cost. This feature, a mainstay since Restaurant Week April 2014, saw up to 33% of diners opt for this offering and will be highlighted in Restaurant Week menus at most participating restaurants. These dishes are priced at an additional Rs. 100 for appetisers and Rs. 200 for main course in Chennai excluding all taxes and service charges at select participating restaurants. I got to try the new Five Sen5es restaurant in The Westin and given below is my review for their RWI menu. The Westin Chennai has three restaurants and one bar. Apart from the Cricket themed Willows bar and the restaurant – Seasonal Tastes, they used to have an Asian speciality restaurant called EEST (standing for Elegant, Exquisite, Serenity and Triumph) and The Poolside Grill & Barbecue Lounge. This Asian restaurant has now been rechristened as Five Sen5es and the lounge is now called as Sunset Grill. While both of these restaurants are a part of the RWI, I was the one who got slotted for Five Sen5es. Velachery, on the whole, has seen tremendous changes during the last half a decade alone. While the old ones still stand proud, this area has gotten two new landmarks with one being the Phoenix Mall and the other being The Westin Hotel which is just a stone’s throw away from the former. The Westin is located on Velachery High Road and it’s hard to miss it after crossing the Phoenix Mall junction. Considering it’s a star hotel, they have valet parking service which takes our mind off the tension of parking our cars. Five Sen5es can rightly be said to be sandwiched between Seasonal Tastes at ground floor and Sunset Grill on the roof. It also shares the floor with Willow bar. 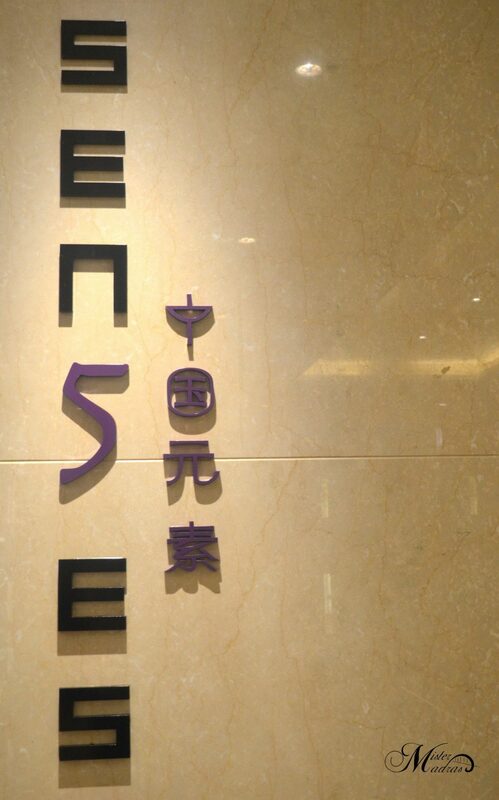 As far as Five Sen5es ambience and decor is concerned, it’s obvious they’ve gone with the ‘less is more’ approach. Past the wall which has the vertically etched restaurant name, the doors open to a display, which I’m sure is an alphabet/letter in Chinese. Considering the fact that my linguistic skills are worse than my reviewing one, I concentrated more on the exhibit they had on this podium which happens to be a Rocheston certification denoting that Five Sen5es is one of the handful of restaurants from Chennai to get this recognition. At the far end is the open display kitchen and for a weekday, they were pretty busy. Next to that, the seating area’s wall was adorned with more Chinese writing, with a beautiful dragon decoration with its own back-lighting running behind the wall hangings. The centre of the floor was where the eyes begged to focus. There’s a slightly elevated circular platform with seats which might cater to larger groups. The round pillar with figurines and the lamps encased in hanging cages look elegant. 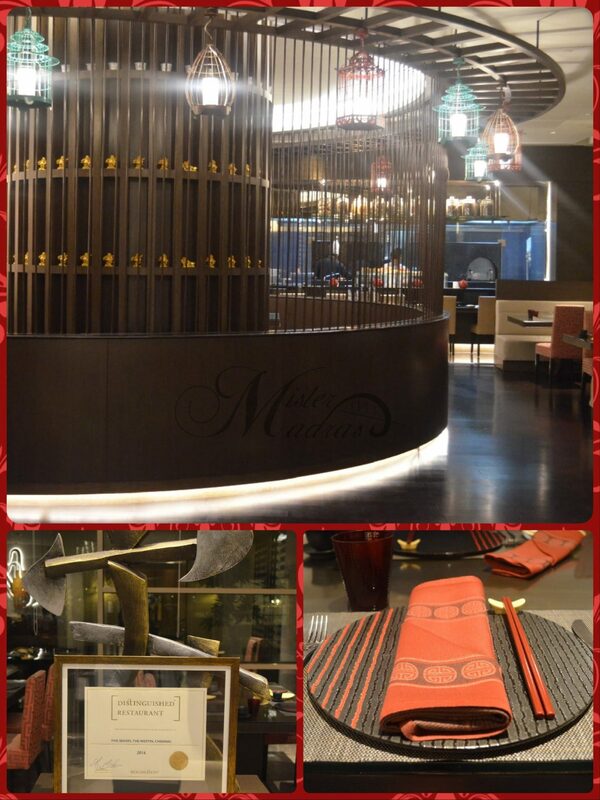 They’ve maintained a red and black theme for their cutlery and table arrangements look exquisite. The beverages we ordered weren’t part of the RWI menu and anything ordered from outside the menu will warrant a separate bill. 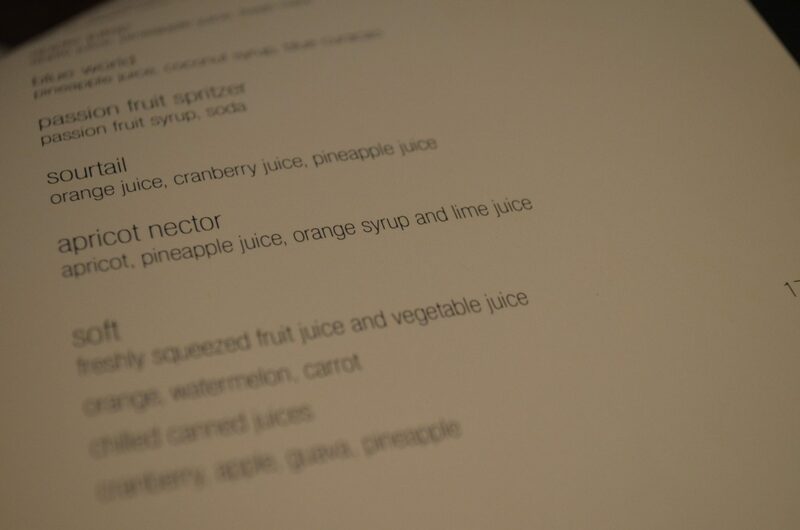 They have a great drinks menu and they also have a good collection of interesting mocktails. I opted for an Apricot Nector while my friend got himself a Sourtail. 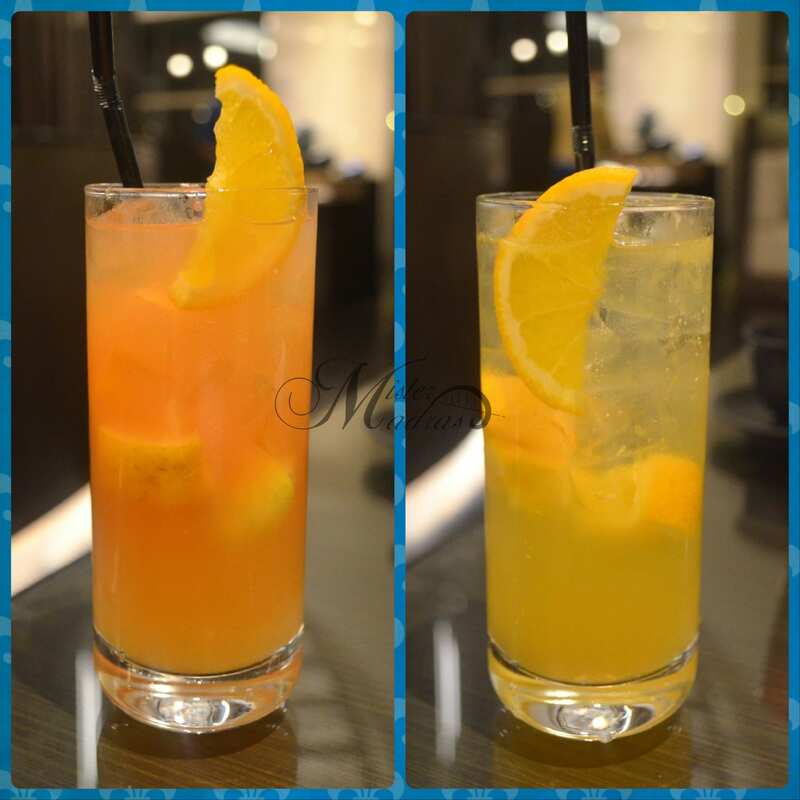 Apricot Nector is a concoction of Apricots, Pineapple juice, Orange syrup and Lime juice, while Sourtail is a blend of Orange, Cranberry and Pineapple juice. Probably for the first time, we were so happy with what we ordered that we didn’t let each other to exchange our drinks to get a taste of what the other one has ordered. Just like their decor, the drinks too looked simple but gets the job done superbly. Never in a million years (OK, i’m exaggerating), Never did I think that i’ll be making a sub-heading titled as what I’ve just given above. Five Sen5es have made me do it for the first time, only because we loved it so much that we were on the verge of awkwardly asking for a second helping. 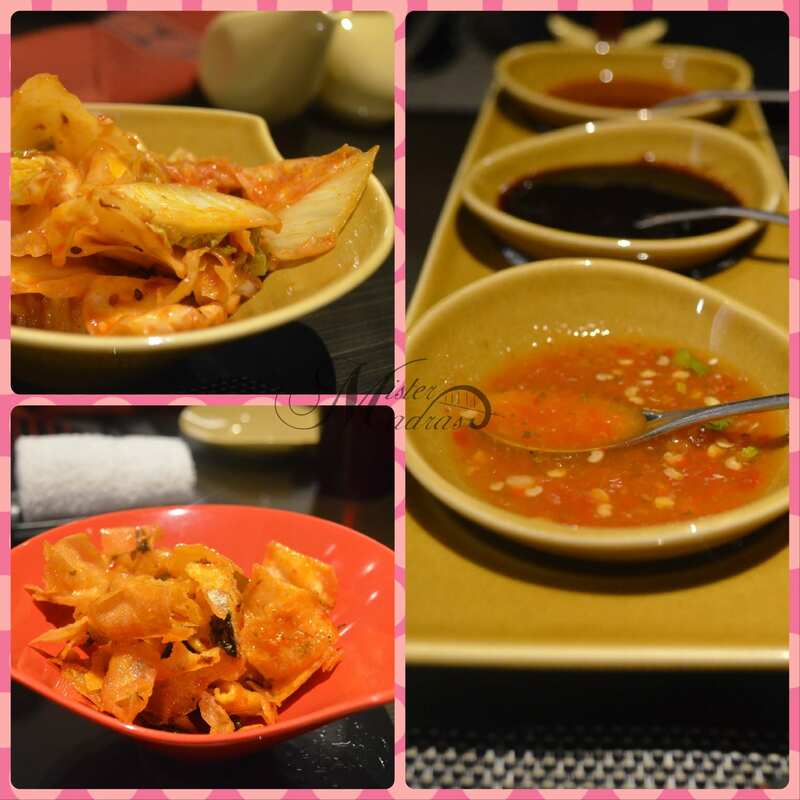 As condiments, we were served Sweet Chilli Wonton and the good ol’ Kimchee. The basil scented deep fried crispy wantons were so heavenly that it got empty in just a couple of minutes. The Korean style pickled cabbages wasn’t too strong and packed the right amount of punch that a Kimchee should have. The table sauces too were exceptional. Out of the Hot Garlic sauce, Tamarind sauce and Thai Lemon Garlic sauce, the last two were instant hits with the starters. Tom Yum Vegetable Soup: This classic Thai soup was a spicy concoction with vegetable chunks. The flavours were strong and its aroma and zest is sure to wake every single cell in the body. Water Chestnuts and Chive Dumplings: A green-y twist to the standard dumpling, courtesy, the inclusion of chives. Not being a huge fan of Water Chestnuts, this dish did quite a good job of changing it to an extent while another dish which you’ll read as you go, made that change permanent. 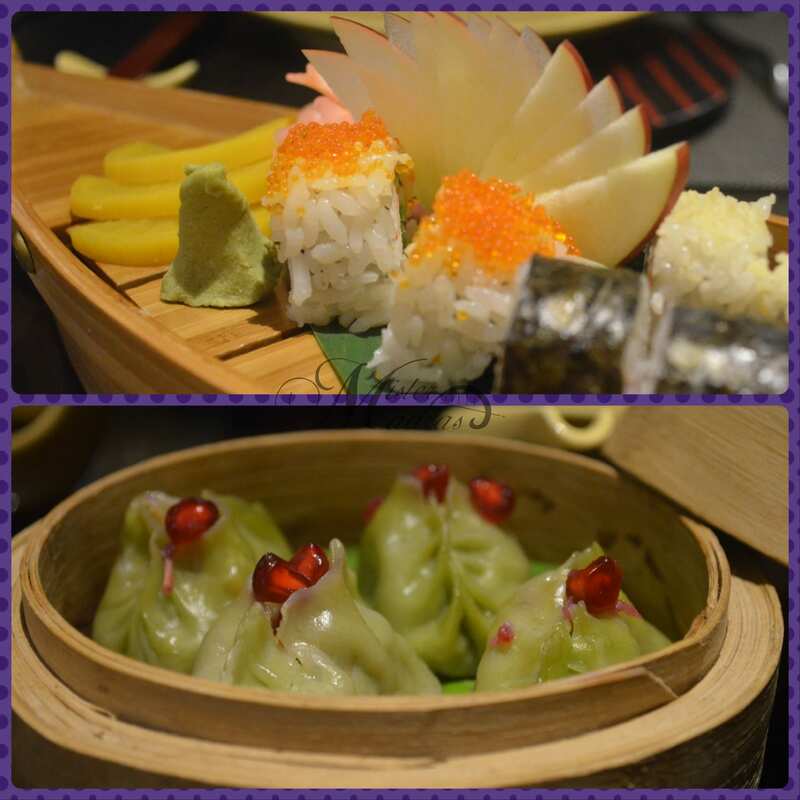 Warm and soothing, this appetiser made me realise that veg dumplings can also be yummy. Vegetable Futomaki & Non-Veg Sushi Platter: While we were supposed to try the Vegetable Futomaki, the chef figured out that I was a sushi maniac and he made it into a platter with non veg sushis too. Apart from the excellent veg Futomaki, we also got Makizushi with fresh fish and Uramaki (If I’m right) with fish eggs on top. They were served gracefully on a boat shaped wooden vessel (pun intended) with the regular pickled garlic slices, a smidgen of wasabi and sliced apple pieces as ornamentation. Yet another time-honoured dish. I personally loved the texture of the lamb meat which was surprisingly in a melt-in-mouth consistency. The crispy fried julienne of lamb in black bean sauce will surely stand the test of time. The wok tossed Chinese greens are a vegetarian’s delight and though we were no where close to that veggie tag, the warm yet crunchy beans, greens and broccoli were quite a treat. This time, we’re off to Malaysia as Tofu Rendang is a well known delicacy from the island country. The fried tofu in a coconut milk brew gravy was an excellent choice for rice based mains. The deliquesce consistency of tofu, something that’s hard to nail and very few does it in town, was out of this world. Basil scented jasmine rice with lip smacking chicken chunks is the soothing mains one would love to have with a spicy side. Being a sucker for moist rice, this one got a thumbs up from me on my first spoonful. The Japanese buckwheat noodles is a classic on it’s own rights but here we gorged on green tea infused Yakisoba noodles which was a first to me. With crunchy veggies, it went very well with the Sliced Lamb in Black Bean sauce. Pumpkin Pudding is one of those few desserts that’s available across the planet in different variations and named according to the country it’s made in. This version is made from puree of pumpkin with a dash of cinnamon. The fresh puree brings out a stunning shade of yellow and the subtle yet sweet taste of it is as good as the way it looks. While the last dessert is famous in many countries, the Mango Sago Pudding is something unique to our continent. Sago is obviously something we’re used to thanks to its inclusion in a number of Indian desserts with the best example being the humble payasam. This pudding is made from sago pearls cooked in coconut cream. The richness of the coconut flavor is the first thing that hits you and it’s taste is nothing short of bliss. As mangoes aren’t in season currently, they’ve used mango puree made into jelly cubes which is the closest we can get to the fruit itself and it works well too. Last but certainly not the least, we got to try the classic dessert from the land of the white elephants – Thailand. Not only are the white elephants abundant here, so is the usage of the celestial liquid that’s called as coconut milk by all fellow humans. Tub Tim Krob consists of ruby water chestnuts that are coloured along with coconut milk. Irrespective of one’s preference over water chestnuts, this dish is sure to find a fan in you. 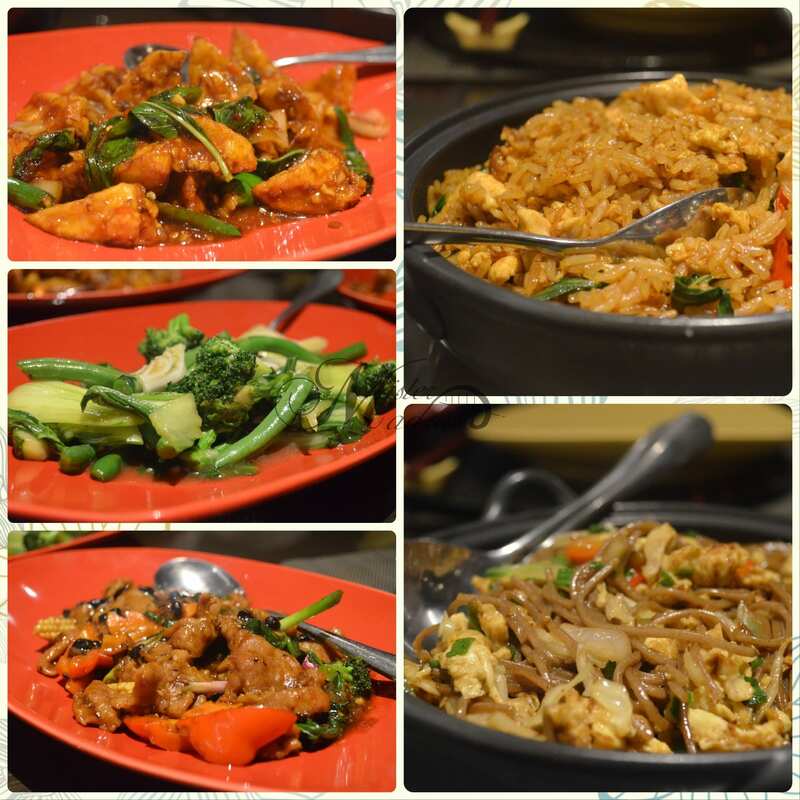 Our chef promised us that we’d love it and we understood why, when we got to try it. This is definitely a must try. Apart from the fact that we get to try exquisite dishes in a price tag that doesn’t bite our wallets, another opportunity RWI creates is the chance for us to catch up with the chefs in action. Chef Devendra and Chef Yatendra Rawat, in spite of having a busy evening, spent their valuable time with us explaining the dishes and telling stories about their experience in and out of the kitchens around the world, which, trust me, is something a foodie would love to hear. I was floored by their staff’s hospitality and customer service. When I spoke about Cricket with the restaurant manager and introduced my friend who had accompanied me as a cricketer, he was more than happy to show us around their Cricket themed bar, Willows and even explained us the offers and happy hours package they offer (Which is stupendous BTW). Overall, I completely enjoyed my dinner at Five Sen5es and I’m sure to be back soon.